A Tabletop Roleplaying Games Blog Est. 2009 by Jonathan Hicks. 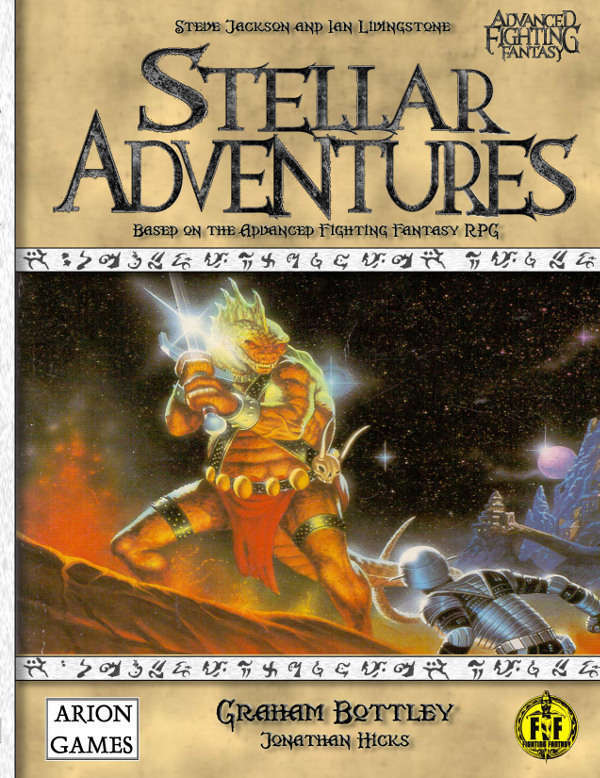 I've been published by the BSFA, I designed a computer game for Battlestar Galactica, I conceived and co-wrote the Advanced Fighting Fantasy 'Stellar Adventures' RPG and I write adventures for the fantasy game, too. I spend my time on this blog interviewing tabletop celebrities, reviewing products and generally having an opinion on all things gaming. It's all good fun. I had an email conversation with a friend who wants to run a Pathfinder high seas pirates game but the ship combat was a bit tme consuming and flat. I just quickly wrote up some ideas for him and hopefully these pointers might help with the basics of naval warfare, but can it really be this simple? I guess it depends on how much detail you want. 'Hi Nik - however you want to play it, matey, it's your game. Can you pregen me a fighter as a character, please, as I've not got my rulebook at the mo? Human, put his proficencies and talents into swordplay and leadership, that kind of stuff. As for vessel combat, if you want to keep it simple, just give a ship some hit points for size and a number of attacks to simulate gun numbers (say, 1 attack for up to 5 guns on one side, 1 attack for bowchasers and stern, fire arc determined facing). Range can be the to-hit number, such as 1 square is a traget number of 3 to hit (hence 4 squares is 12) and the roll is a straight forward D20, no attack mods. Speed is determined by size, lets say 1 square of movement per round for every 50 hit points (the larger the vessel, the more cloth - I'm not sure how accurate that is!). 1 square of movement also means 1 face of a turn, so to move 90 degrees uses one space of movement. A hex map would be better, but a D&D battlemat is squares so you'll have to make do! Hit points could also equal crew numbers, so a reduction in crew/hitpoints could mean a loss of ability. If you make the hit points number divisible by four by default, and then let's quarter the hit points so that every quarter lost means a -1 to rolls and a single attack. So, a crew of 20 means that losing 5 crew means -1 to hit and a loss of 1 attack. Attacks are taken from the side facing the enemy ship. HP: 120. Guns: Port 20 (4 attacks), Starboard 20 (4 attacks), Fore bowchasers 1 (1 attack), Aft 1 (1 attack). 1D4 damage per successful attack. Speed: 2 squares. This way, ships of a similar build would be evenly matched but you'd know not to go up against a warship with a whaler. If you want to add some PC interaction, let's say the gunners get a +1 to hit with a succesful PCs leadership roll, DC20, with a +2 if they roll a natural 20. To repair a vessel on the go, 1 hit point lost equals 2 hours of work. For every quarter crew lost doubles that time. Just some ideas. Either way, I'll have a fighter, please! So, I’m never going to get the chance to do anything like this so I figured I’d put it out there. These are a few ideas I had about a monthly roleplaying magazine. 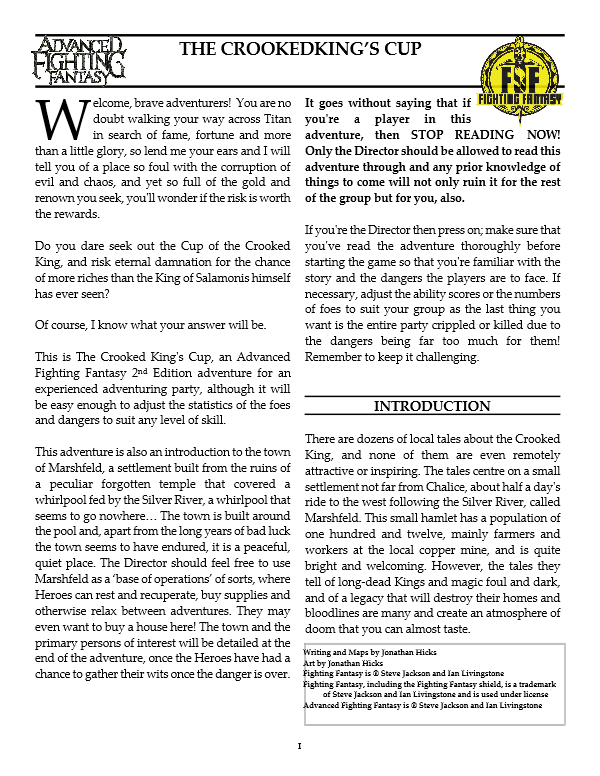 I have always been of the mind that an affordable monthly magazine on the magazine racks of high street stores would be a much better selling point and avenue for new gamers than great big comprehensive rulebooks available in specialist shops or on the internet, where prospective gamers won’t see them or be able to afford them. 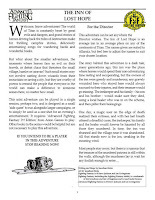 Creating a magazine-based game such as this and making it a monthly affair at a decent price might make tabletop roleplaying a lot more attractive and help ease players into the hobby. Even older gamers could get some enjoyment out of it – a new setting to game in, using a system they might come to enjoy? How can that be a bad thing? My initial idea was to model it after Basic Dungeons and Dragons and that’s still my favourite approach. The only possible problem is the polyhedral dice required, but if a system could be developed using basic six-sided dice then that should solve that problem. 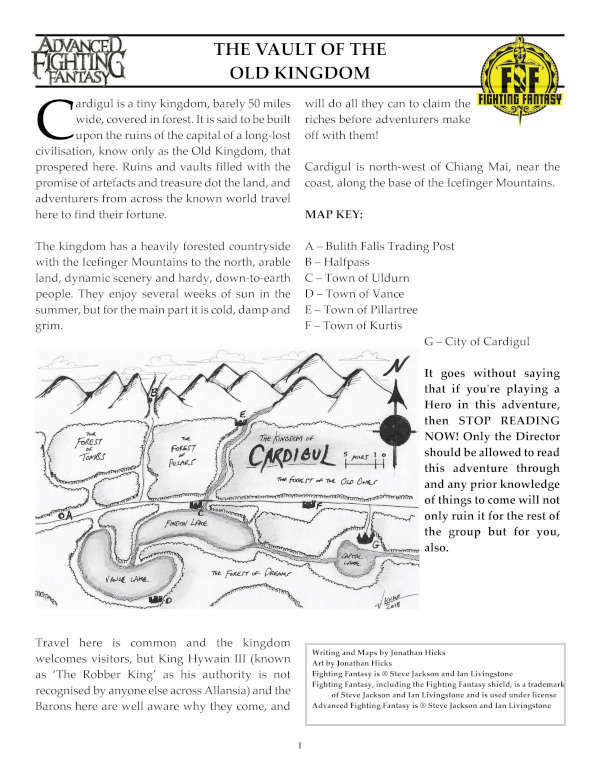 1 – The magazine will be a full roleplaying game aimed at the teen market with the very first issue being the rules, the basic concepts and the setting. The format could be similar to the magazine dedicated to the ‘Lord of the Rings’ Battles game by Games Workshop. 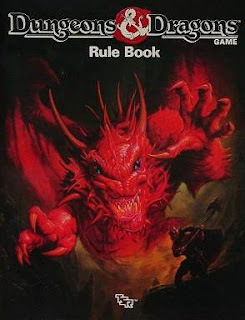 2 – Every following issue could then have extra rules, guidance for GMs, options for players, two or three scenarios and adventures, expansions on the game world, optional material, reader letters and fan material, and even monster figurines the players can use in an average game. 3 - If the game goes down the standard fantasy route, which would be the best option, the first issue could have a special introductory pack of four or five figures of the different classes the players can use and the dice required. At the very least, each issue could have a sheet of cut-out cardboard tokens. 4 – Make it a levelling game, a la Dungeons and Dragons, so that the players have a sense of progress as they play through the magazines. 5 – The target audience of the magazine should be early to late teens, and it should be presented as an introductory game that explains the rules and the hobby step by step. 6 – A website could support the magazine in the form of making back issues available, articles on the game itself and extra material. 7 – Once the game has progressed, other settings could be introduced such as science fiction or horror. Extra rules can be added and the magazine can then cater for these extra settings but still concentrate primarily on the initial setting. 8 – Initial first issues should be put on the market during autumn/winter months when evenings are longer and children need something to do. In the summer there are plenty of things to do outside in the longer, brighter evenings. Dark Heresy - a one note campaign setting? The wargaming roots of the Warhammer 40K universe doesn't seem to leave much room for characterisation and roleplaying opportunities. Everything seems to be 'KILL DEM ALL FOR DA EMPURRAH!!!' and it all seems to be black and white - humans against the galaxy. Well... maybe black and dark. It took Captain Titus from the video game 'Space Marine' to make me wonder at the depth of humanity and the broadness of character an Adeptus Astartes could have, and I could totally see him as a character I could follow in stories and the like. Considering the bleak, nihilistic and severely limited tone of the setting, is it possible for players to create characters with emotion and character? Or is that a hangover I have from the wargame, that limited need for depth considering that what the writers and designers were writing about was groups of beings simply blowing the crap out of each other? I love the 40K setting, I love the darkness and the gothic design. I can easily make the game my own and inject as much depth and emotion as I please, but the effectiveness of that will depend on how my players view the setting. Will they want to play depth, or just shoot stuff with their bolt pistols? I think this is one of those settings that can really divide opinion on how it should be approached. Marvel's Avengers Assemble... bad, bad timing. I saw the new Avengers movie last night. It was, quite simply, wonderfully awesome. 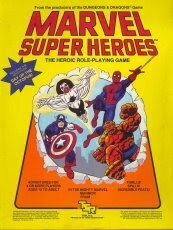 The problem I have now, is, that I want to run a huge Marvel Super Heroes game more than ever. I want to create my own mythos, my own universe, my own set of weird and wonderful characters and locations and villains and aliens and initiatives and groups and powers and... you get the idea. I've got this renewed interest and vigour regarding this genre and I'd love to have a stab at it using this system in particular. Of course, I'm still running a Pathfinder campaign and I'm supposed to be committed to that. My heart really isn't in it anymore - I'm not sure if I was really enjoying all that much anyway, and I may have been trying to convince myself otherwise - but I need to get past that. I've made a commitment and this fondness for superheroes might pass somewhat while I'm caught up in the Marvel moment. Besides, my mate Louis is opening his store COMSHOP in Lichfield this week, and there's going to be a backroom to game in. Maybe I'll save this campaign for that location... Excelsior! A return to Basic Dungeons & Dragons? I'm really enjoying running my current Pathfinder campaign but I do miss my simple games, such as Dragon Warriors or Star Wars D6. I want to make sure the gaming group enjoys the game we're playing so I'd like to stick with the system we're using now. In other words, I want simplicity but I want to keep playing the D20 system game. This has bought me back to Basic D&D. I recently got the basic rulebook for the black box edition and it's perfect for a decent game from levels 1-5 (that's a couple of campaigns easy, if I limit the XP for gold angle) but I've never been a fan of the THAC0 system or the dicey saving throws. Surely it can't be that difficult to take the new new 3.X rules and incorporate them into the Basic D&D game? If I could do that, I could drop the rules I dislike and my players would have a lite version of the game system they love. There's a greater sense of progression and achievment in any version of D&D then there is in any other game and I think that's what my players enjoy. I love game systems that allow characters to grow of their own accord - Runequest and the D6 system spring to mind here - but right now there's a 'goal to aim for' sensibility at the table and a heady mix of old school and new blood. I like Pathfinder, but I'd like that progression to be a little less complicated. I must be getting lazy in my old age as simple suits me just fine. The Vault of the Old Kingdom available now! The Crooked King's Cup available now! The Inn of Lost Hope available now! 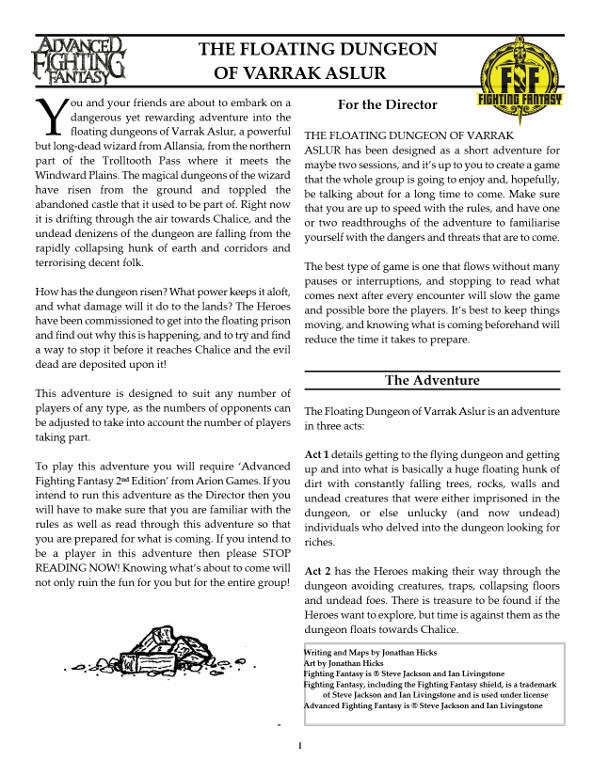 The Floating Dungeon of Varrak Aslur available now! 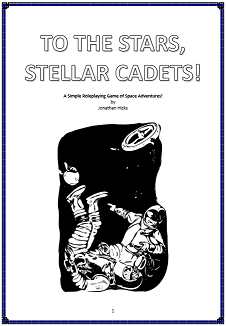 AFF Stellar Adventures available now! 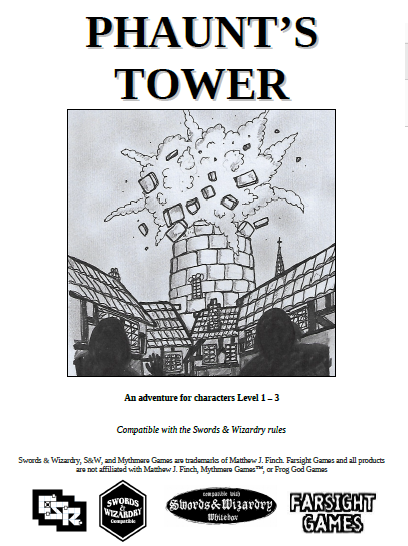 Download a FREE roleplaying game! The oldest & largest independent roleplaying site on the Internet. Collecting Star Wars news and fan interactions from across the planet. 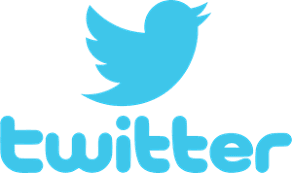 All original content on this blog (c) Jonathan Hicks/Farsight Blogger. None of the original material on this blog may be reproduced for financial purposes without permission. If you'd like to use the material on your own blog or website then by all means do so - you can copy and paste the article, but be sure to credit Farsight Blogger for the content, link back to this blog and send me a message to let me know you've done it. See the Creative Commons license below. Farsight Blogger by Jonathan Hicks is licensed under a Creative Commons Attribution-NonCommercial-NoDerivatives 4.0 International License. Based on a work at http://www.farsightblogger.blogspot.co.uk/. All original content (c) Jonathan Hicks / Farsight Blogger, not to be reproduced without permission. Simple theme. Powered by Blogger.